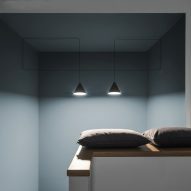 Italian design studio AIM has renovated a home in Milan to add storage in the walls and a disguised central staircase. 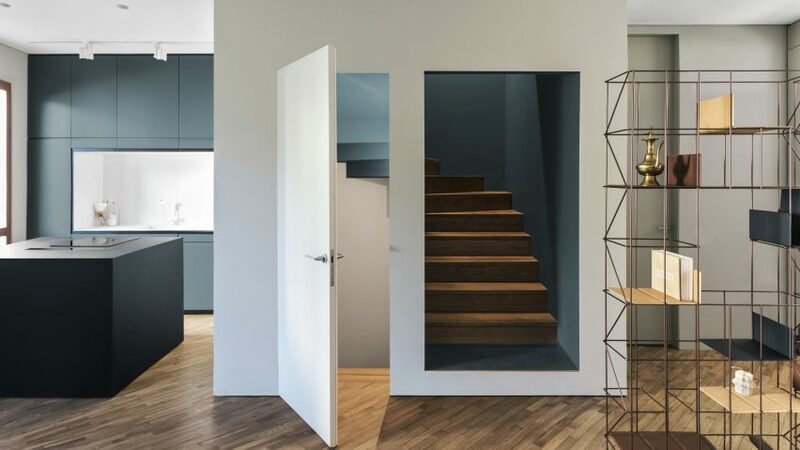 Arranged over three levels, the Out of the Blue renovation centres around a concealed stairwell, which occupies a considerable proportion of the house. On the ground floor of the house is the living, dining and kitchen areas, with a basement level found on the floor below. Two bedrooms and a bathroom are located on the second floor. At only 150 metres squared, the house employs interior elements that are able to serve several functions. 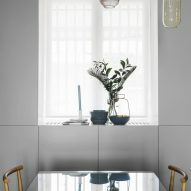 Central to this is the kitchen island, which is designed to work as an adaptable centrepiece on the house's main level. 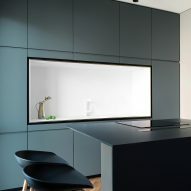 "The nerve-centre is a monolith of Deep Titanium Corian, which accommodates the induction hob, designed to create continuity throughout the kitchen and living area," said AIM. 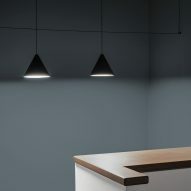 "An iconic and versatile element, it can be used as a worktop in the preparation stages, then transformed into a dining table for lunches and intimate dinners." Also in the kitchen and dining areas of the house are two feature walls covered in cupboard doors. The walls have been created to provide essential storage space for the house while also hiding away utilities such as radiators. 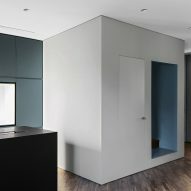 "The entire fitted furniture was designed to belong to the architecture with the function of optimising the spaces and creating storage both in the living area and the large accessorised walls in the entrance," explained AIM. 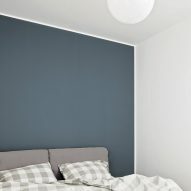 Many of the storage walls are painted in deep grey, a colour that recurs throughout the interior. Brass fittings and finishings complement the cool palette. 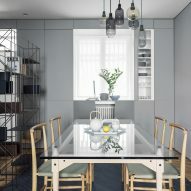 The designers have decorated the house in furniture they believe fits the interior's aesthetic, including pieces from Hay, Michael Anastassiades and Franco Albini. Innovative storage solutions have featured in a number of recent interior renovations. 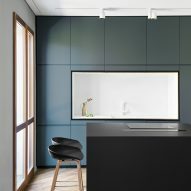 French studio h2o Architectes recently installed concealed cabinets inside a 1960s flat renovation in Sceaux, while Maayan Zusman created bespoke storage in an apartment in Tel Aviv.